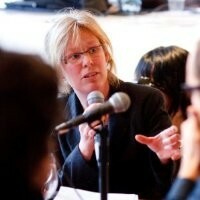 Marieke Hillen initiates, coordinates and writes within the field of urban development. She tries to develop a form of slow criticism that keeps up pace with the slow urbanism of the projects she initiates. Hillen initiates projects that include locals, and works mainly in mixed neighbourhoods like Rotterdam-West. Singeldingen is a recurrent festival in the summer months. Encounters, music, experiments, poetry, educational projects, tea, coffee, cooks all play a role in an accessible event. Recently, she and others started the Wijkpaleis – a place to have it made. It is an emerging initiative that breathes new live into the makers culture that is existent in Rotterdam-West. It motivates people to broaden their horizon by making and considers the neighbourhood as a social library in which you can consult and utilize the capabilities and knowledge of neighbours.